Welcome to the forest of the beech. 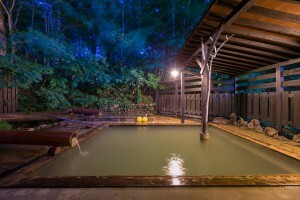 Onsens, or hot springs, have long played an important role in Japan. Hundreds of years ago, people used them to heal wounds and injuries, and they are now seen as a therapeutic practice that helps restore both mind and body. In Akita, onsens are seen as an extension of the earth, a source of minerals and vitamins that enrich the naturally hot water that bubbles from the ground. The hot springs are part of a wholly healthy lifestyle that includes not only immersing yourself in the mineral-rich waters, but also cleansing and filling your body with healthy foods. One of Akita’s healthiest foods are its “mountain vegetables.” Known as sansai, these wild greens are a prefectural local favorite. Because these durable plants survive harsh snow conditions during the winter and ripen later in the spring, sansai are seen as a kind of “power food,” and by feeding your body with these hardy vegetables, Akita locals believe you are taking in that power to both detox and nourish your body. Traditionally, in the countryside of Japan, fishermen and farmers would spend their off seasons at the onsens to heal up for the work to come. This practice was known as toji—literally, “hot spring cure,” and some onsen locations still offer this opportunity today. Toji-ba, or hot spring health resorts, are not just vacation spots, but can be locations for long-term stay: guests can cook in the kitchens provided at the ryokans and bathe daily, as a way to recover both mentally and physically. 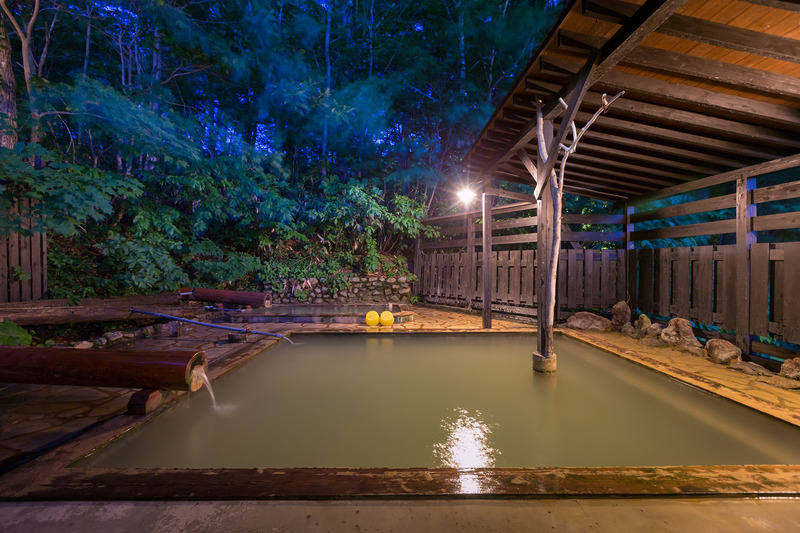 Onsens are great for locals on a journey to a healthier body as well as tourists looking for a relaxing getaway to recharge. In between baths, Akita offers scenic hikes amongst buna (Japanese beech) trees. The collection of lush trees and mountain water streams make for peaceful hikes during the spring, summer and fall months. 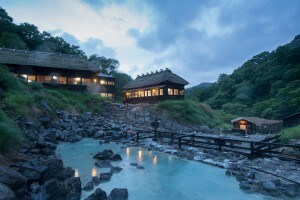 Taenoyu is a unique onsen in that men and women never miss out on any of the five baths available: the separate bath locations for men and women switch every evening. The open-air bath, which is gender mixed, feels like an infinity pool, and overlooks a giant waterfall at the edge of the space. With a backdrop of mountains covered with trees, the outdoor bath area immerses you in all of the natural beauty that Akita has to offer. One indoor bath has a rock-lined edge filled with orange-golden color water, and is almost an open-air bath itself, providing a view of the forest outside its wooden overhang. Another indoor bath is filled with stones and clear water, allowing you to experience a foot massage when you press your feet against the bottom of the bath. As you enter the ryokan, before taking the baths, enjoy an afternoon tea in the dining area also used to serve breakfast, with a view of a small river and various trees stretching across the mountain. A separate dining area is available for dinner, where many of Akita’s famous dishes, including kiritanpo and sansai, are served. The multi-course dinner is complemented with Akita’s local sake, or nihonshu, produced from Akita-grown rice and pure spring water. Ogama Onsen, located in the middle of a steep slope on the mountain, features large gama (toad) statues at the entrance of the building, in honor of the hot spring’s name. Previously housing a high school, the long halls and classrooms of Ogama Onsen have been turned into changing areas, dining spaces, and various baths within the ryokan. Adding to the “old school” feeling is a statue at the front of the ryokan: Ninomiya Kinjiro, a boy reading while transporting wood on his back, is a famous symbol that represents the virtues of study and hard physical labor. Across from the statue, a row of footbaths lines the entrance of the ryokan, making it a great pit stop where you can refresh your legs and feet while trekking through the mountain, without having to change your clothes or go inside to use the changing area. At Ogama, the water has a greenish color that looks like matcha. There are outdoor and indoor baths, both of which provide views of the essentially untouched natural surroundings of the ryokan. The four baths at Ogama are approximately 98 degrees year-round, and open all four seasons. 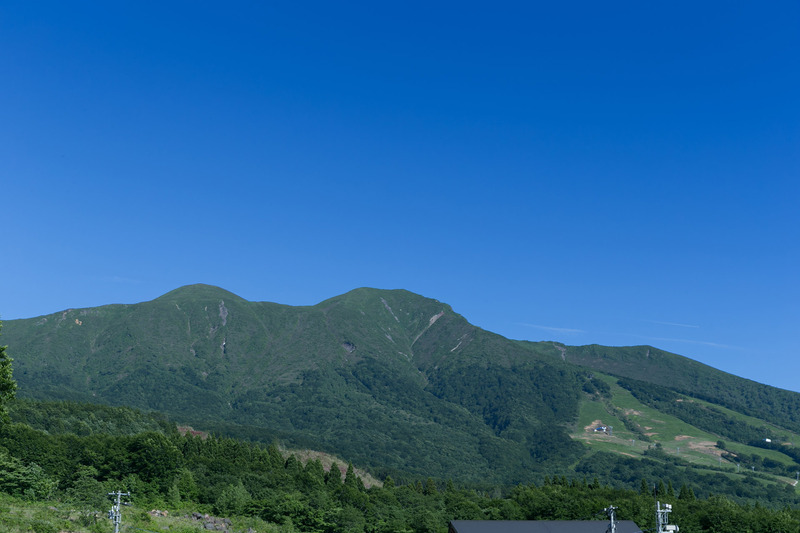 Mountain trails and ski slopes in close proximity to the bathing areas make it easy for guests to go on hikes during the warmer months or go skiing during the colder months in between onsen dips. Ganiba gets its name from the many crabs (in Japanese, kani or gani) that can be seen in the river next to the open-air baths. The ryokan, which has been open since 1846, has two kinds of spring sources. But before you walk into Ganiba Onsen, the mini-torii shrine at the entrance of the beautifully designed space may first catch your eye. The shrine has long been a place where local people go to pray and thank the gods for the natural gifts from the surrounding land: food, wood, and bountiful hot spring water. Balconies made of wooden logs and carefully crafted stone walls decorate the outside of the ryokan, making for a naturally charming aesthetic. 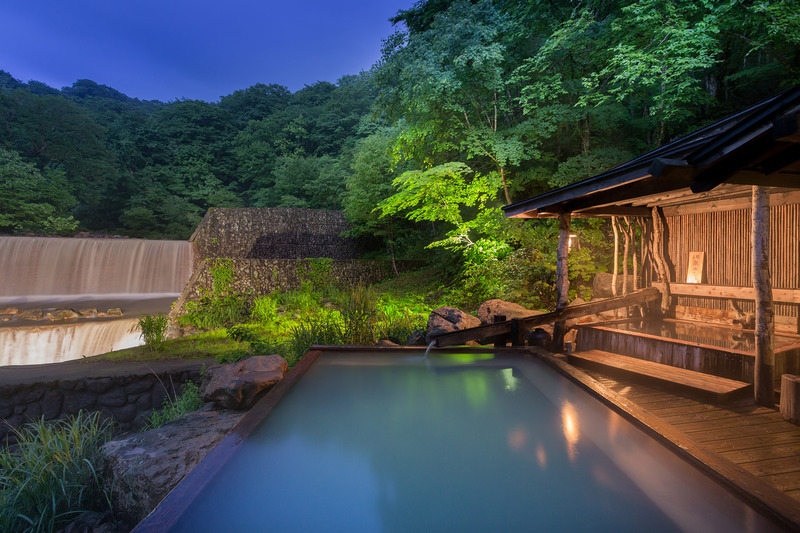 If you want to truly experience any of the four seasons while soaking in the onsen, Ganiba is the perfect location, as the outdoor bath is situated at the end of a 50-meter walkway. On the way to this open-air bath you can experience a picturesque scene as you walk under the tree-branch canopies that extend above the pathway. Hear the birds chirping or the sound of the small mountain stream running under the bridge that connects the walkway to the entrance during the spring, or trek through the snow in boots provided by the ryokan during the winter months, to make you feel like you’ve truly earned your bath. Multi-course, traditional Japanese foods consisting of local and seasonal ingredients are served for breakfast and dinner at the ryokan. This traditional ryokan was named for its founder. Magoroku features a collection of black, wooden houses resembling classic onsen huts gathered around the natural sources of the hot spring. 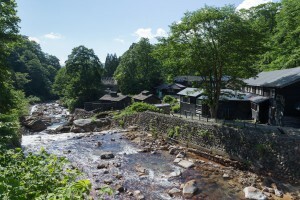 Entering the village of huts, a large bridge over a crystal-clear mountain stream leads the way to Magoroku. Stone walls line the riverbank, creating a peaceful setting as you walk into full view of the ryokan. 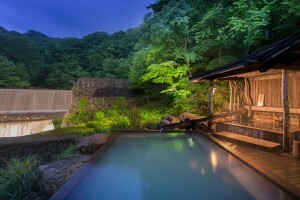 The ryokan’s rustic atmosphere is made complete with both indoor and outdoor baths. Keep an eye open for the smaller huts with “onsen roofs.” These additional, smaller roofs on top of the wooden houses indicate a hut with a hot spring inside. There is an indoor stone bath with two hot spring “waterfalls” that release water at a higher pressure to help massage sore muscles. An outdoor bath gives you a view of the cascading mountains and a feeling that nature truly present in your backyard. The ryokan is open during all four seasons, allowing for a different scenic view and experience over various months, from the snow-covered mountains during the winter to the lush trees and greenery during the summer. Nyuto Mountain’s oldest and most popular onsen, Tsurunoyu was established in the 1600s, during the Edo Period, when it housed many elite government officials and members of royalty on their travels. 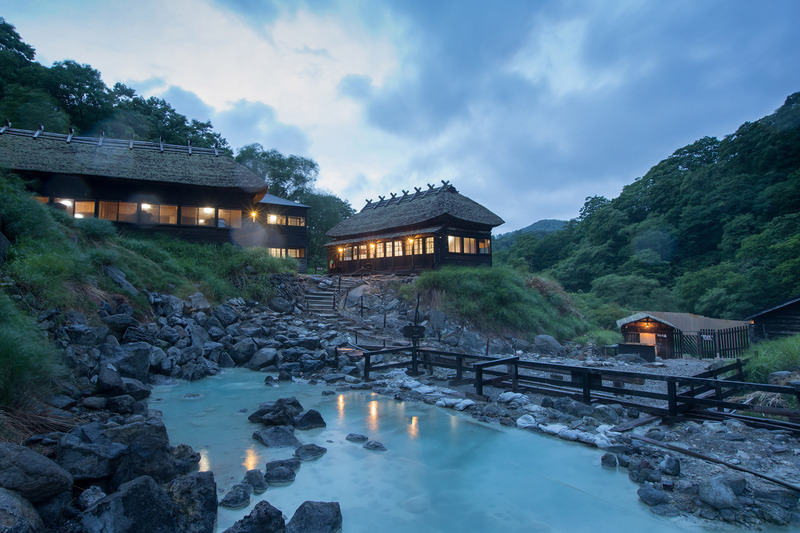 The onsen continues to hold its iconic title and offers guests a rustic and authentic stay with an irori, or sunken fireplace, to cook with and to heat up each room. Tsurunoyu, which translates as “crane onsen,” takes its name from the legend of a badly injured crane that soaked itself in the hot spring bath and was healed in its mineral-rich waters. In traditional Japanese folklore, cranes were believed to live for thousands of years; they are still linked with good fortune and longevity today, and they are the symbol of this celebrated ryokan. Four baths, each with a unique feel and mineral composition, are featured at the ryokan, including one of the only onsens in the world where you can bathe in the actual hot spring source. 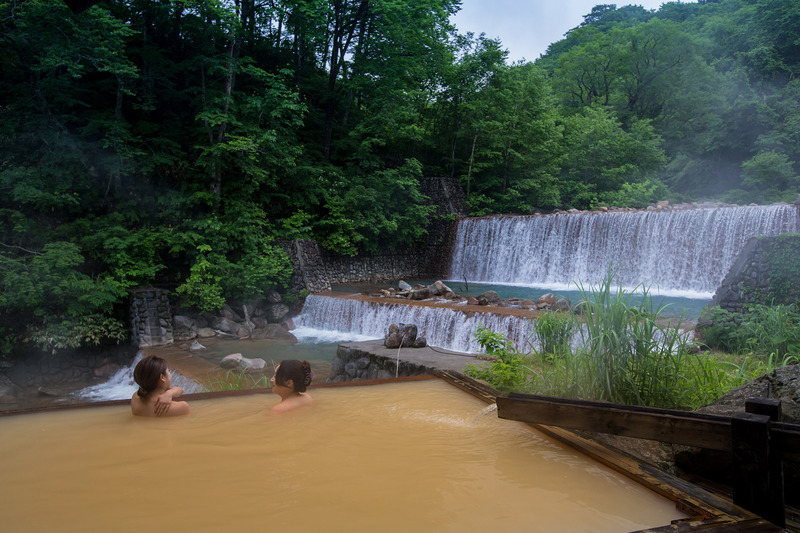 Typically, the hot spring source is transferred to a bath where the temperature is controlled; however, the bath at Tsurunoyu is 100% controlled by the forces of nature, allowing guests to feel a true connection with the earth. The region’s most modern onsen, Kyukamura was first built by the government to promote health and tourism, but is now owned by several different companies. There are 38 rooms available in Western or Japanese style at this contemporarily designed ryokan. 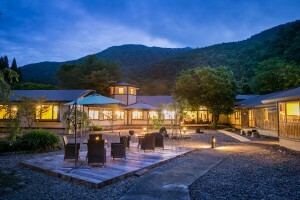 Kyukamura’s modern design and amenities (it’s the only ryokan on Nyuto Mountain with an elevator or tennis courts) make it the perfect choice for large groups, families and events. 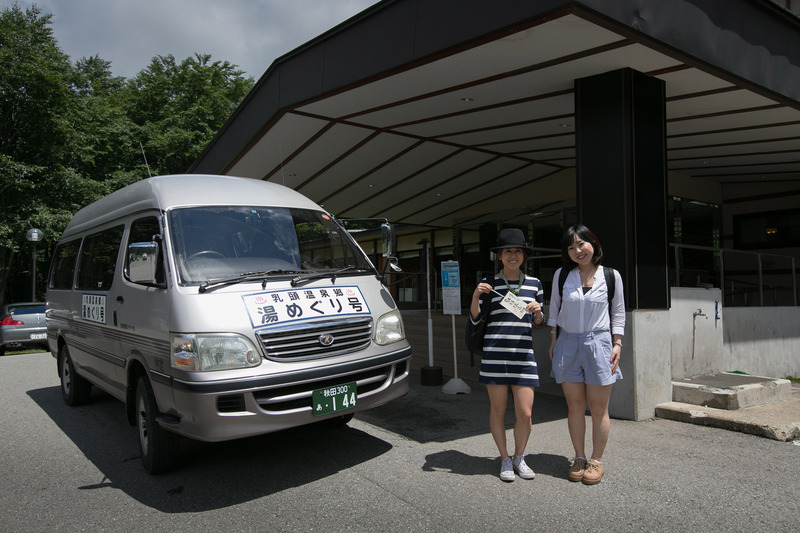 Towada-Hachimantai, the National Park located on the mountain, can be explored in depth through a tour and tour guide set up at the ryokan. 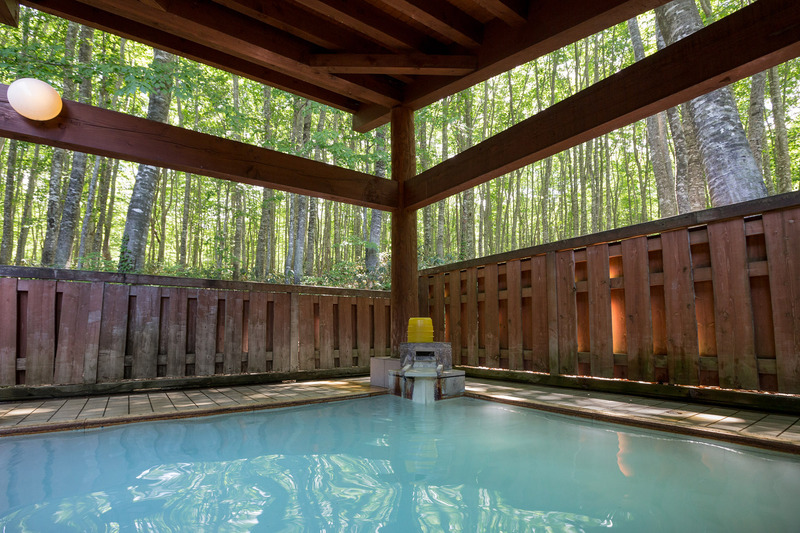 The outdoor bath is covered with a wooden overhang and surrounded by an abundance of buna, Japanese beech trees. The indoor bath features a mix of contemporary and traditional design, with modern touches standing out amidst the classic design of the wooden onsen huts. 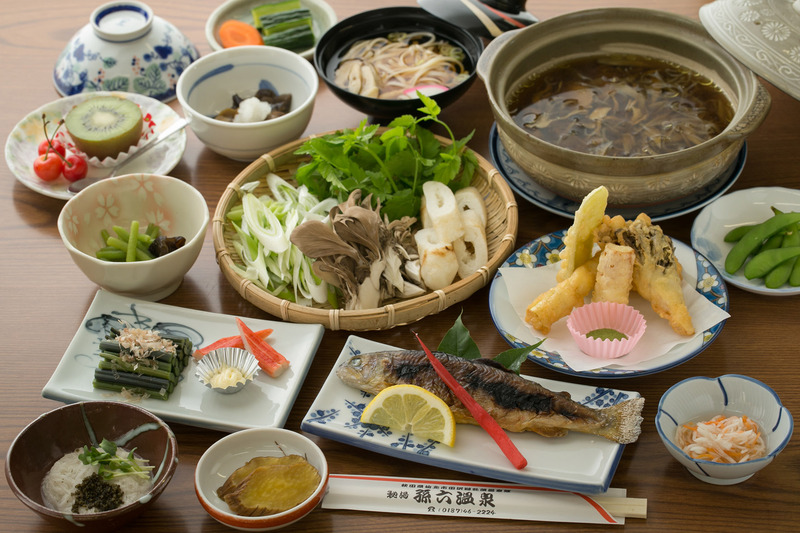 A buffet full of Akita’s local cuisine in the banquet room is offered for breakfast and dinner. You can enjoy each meal in the yukatas provided by Kyukamura, and make use of the onsens during all hours of the day. One of the signature features of this onsen, whose name translates as “black onsen,” is its black hard-boiled eggs. Fresh eggs are placed in nets and submerged in the onsen’s hot spring source to boil. After the eggs sit in the sulfurous onsen water, the hard-boiled eggs turn black on the outside from the chemical reactions. The egg on the inside remains white, and the hard-boiled eggs are said to not spoil for a long time because of the minerals that help kill bacteria. This directly translates into what Kuroyu believes the onsen can do to help the body. 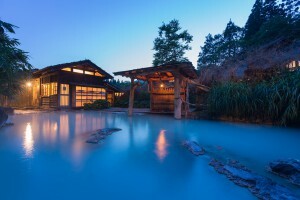 The minerals in the hot spring water, rich in aroma, are believed to help heal skin diseases and detoxify the body. “Waterfalls” of onsen water, which can also be found at Magoroku Onsen, are available in a separate hut near the baths to help soothe sore muscles with a natural, water-pressure massage. Said to have been established 330 years ago, Kuroyu is the furthest onsen from the Nyuto Village. The ryokan is known for its longterm stays available for toji-ba (long-term stays), fully equipped with a kitchen where you can prepare all your own meals and an outdoor BBQ for anyone to enjoy. If you’re looking to go more towards the relaxation route, though, you can have dinner served in your room. Miyakowasure takes its name from the richly colored purple tea flowers that bloom in the garden located in the center of the ryokan. This is the perfect place to stay if you’re looking for relaxation plus luxury. With a majority of rooms housing their own private onsen, complete with a view overlooking a still lake, there is no need to leave your private space except to escape for a delicious meal in the dining area. Sample a flight of local nihonshu with a multi-course dinner made from Akita’s fresh local ingredients, and enjoy Miyakowasure’s hearty breakfast, served in multiple courses along with a selection of fresh fruit, vegetables and yogurt. If you do decide you’d like a change of scenery, Miyakowasure has men’s and women’s baths in an indoor setting, as well as a private outdoor bath. The baths contain sulfur in two different temperatures and at two different intensities. For those who prefer a bed over a futon, Western style rooms are available in addition to the traditional, Japanese-style rooms. The rooms wrap around the central garden, where guests can enjoy a peaceful walk or rest on the benches and tables arranged around the carefully crafted space. 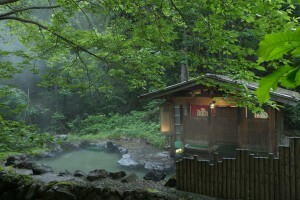 The Nyuto Mountain area is known for the staggering variety of its hot spring sources and settings. Onsen come in many different types, depending on the mineral composition of their water(everything from carbonates to sulfur), making for hot springs that vary in color, texture, and even aroma. These waters are even believed to have medicinal qualities, and while onsens aren’t meant to replace doctor’s orders, there is a long traditional history that describes their power to heal-promoting better sleep, relieving stress, and even curing skin diseases or lowering blood pressure. 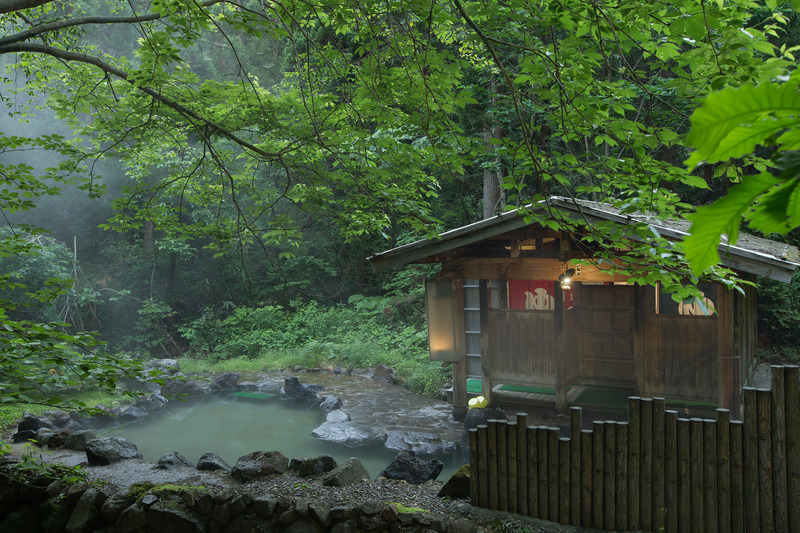 The surroundings of each ryokan differ as well, making each onsen a truly unique experience. 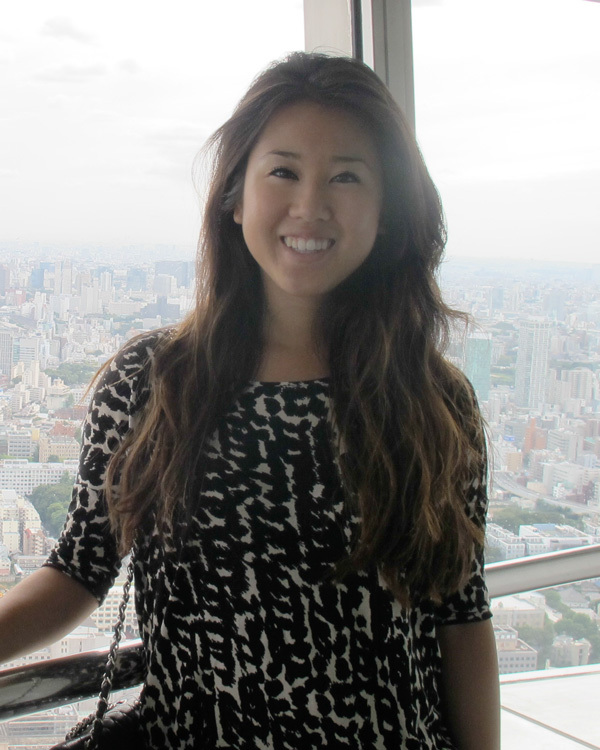 Sami has four years of experience in PR, marketing, and advertising in New York city and Tokyo, after graduating with a business marketing degree in California. She spent one year at a Fashion PR firm and two years at Vogue Magazine. Clients during her time at Vogue were luxury jewelry and watch brands including Bulgari, Harry Winston, and Rolex. Sami worked on projects for Vogue Japan during her first six months in Tokyo before becoming an Editorial Consultant at the Tokyo Weekender.